I wanted to do a memorable pumpkin this year and I thought this one would be just the ticket. I’m not a huge Jersey Shore fan, admittedly, I’ve caught a marathon or two on occasion. 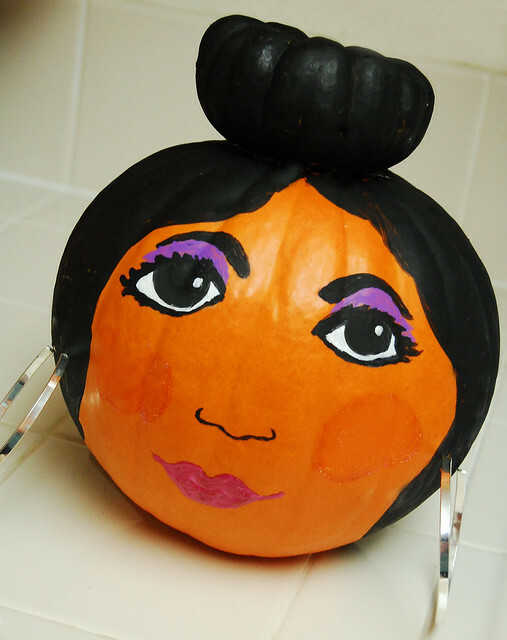 I do know that people are totally obsessed with Snooki and her funny ways and I wanted to celebrate her pop culture icon through craft. A while back I was thinking about her guidette hair and I had a funny thought that it looked like a mini pumpkin sitting on top of her head. So, with that random thought came the idea to do this pumpkin. 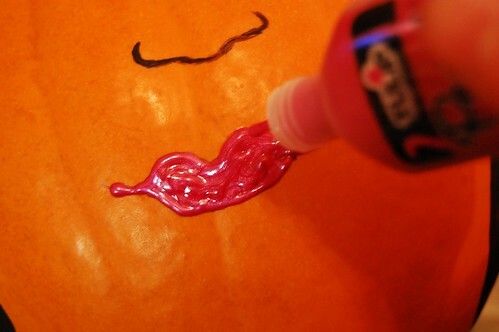 And I knew I had to add it to my Halloween craft list! Before you begin: Clean off and wipe down your pumpkins with wet cloth. 1. Gather all your supplies. Admittedly, this pic doesn’t contain all the items listed above. I get a little camera snap happy and don’t always organize my materials. I sometimes wing it as I go. 3. 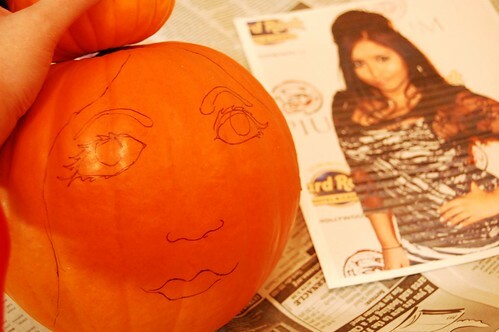 With a printout of Snooki to go by, I drew her face on with a Sharpie. 4. Paint her hair black and let dry. You may have to do this in sections and apply two coats. 5. 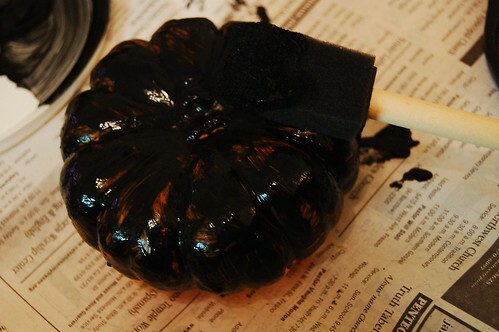 Paint mini pumpkin black. Again, you may have to do in sections and apply two coats. Let dry. 6. Paint detail into her face. Use a liner brush to do the black and eyeliner and mascara for eyes. I used the Tulip 3D Fashion Paint in a Pearl finish for her lips (and to make it dimensional like her infamous pucker). 7. I made a mistake and forgot to photograph this step! You cut a piece of dowel rod to size (you can also use a pencil…this is what I did). Poke the pencil through the large pumpkin at the crown and slide down. 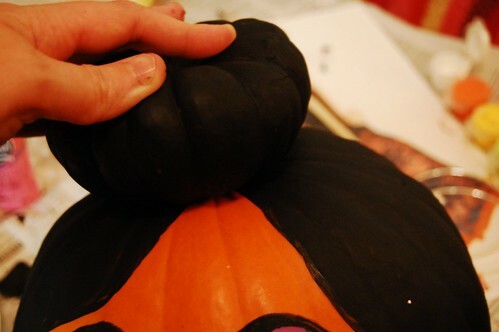 Now poke the top of the pencil through the bottom crown of the small pumpkin. 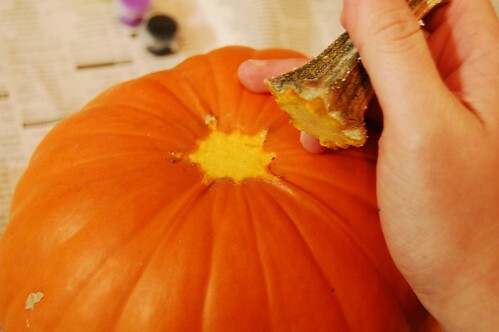 Once you make the hole in the bottom of the mini pumpkin, remove it and move onto step 8. 8. 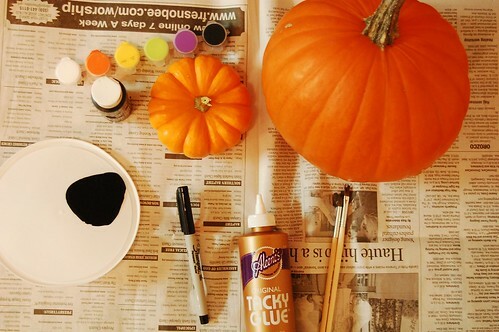 Add glue to the bottom of the mini pumpkin (this will give your pumpkin added stability and make sure the top pumpkin stays connected to the bottom pumpkin. 9. Push mini pumpkin back onto pencil this time and connect the two pumpkins together. Let glue dry thoroughly. 10. When totally dry, spray with Aleene’s® Spray Acrylic Sealer™ to help preserve the pumpkin throughout the season! 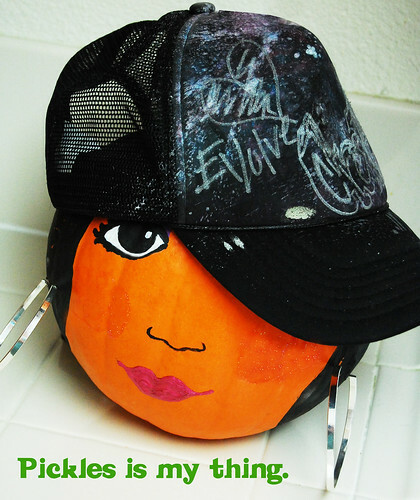 Adorn your Snooki pumpkin with hoop earrings and a hat if you want. Give her a pickle and call it just another day at the Jersey Shore! But, for authenticity, you should have painted the Ed Hardy logo on that hat. That is just too clever! Disturbing, but cool. Did you catch the South Park episode with the Jersey invasion? As a reluctant resident of NJ I can appreciate the stereotypes they were perpetuating. I was introduced to Jersey Shore this summer by my 21 year old home from college. I was horrified but sat down to watch. Love your pumpkin. Now that definitely requires a fist pump or two! Girl, this is awesome!! Sharing on Facebook. This is too funny. Great creativity. Ha ha. 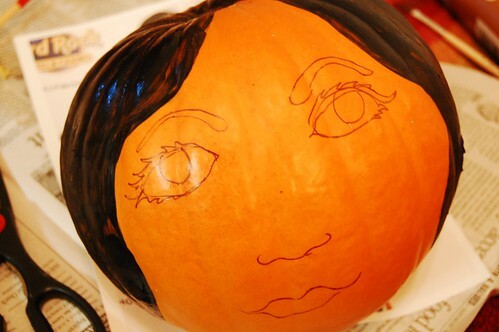 Your pumpkin is on Perez Hilton today!